The Dynamic balancing machine model ZB20TCA has an advanced robot process that builds automation to ensure that precision is achieved. A two-plane horizontal balancing machine, the ZB20TCA has been designed so the rotor is transferred to the correction station by a robot that manipulates the rotors, so that weights can be added to both planes to correct imbalance automatically. Weights are riveted in fixed positions depending on the amount of imbalance to be corrected. With an automatic cycle, which includes a recheck measuring spin after correction has been completed, the machine is designed to offer the ultimate precision. Fitted with a belt drive system, the machine can also drive different types of rotor. 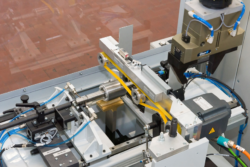 An advantage of this model is that it can be manually loaded by an operator or integrated within an automatic handling system. The ZB20TCA balancing machine has an impressed cycle time of less than 90 seconds but will be defined by the number of correction weights required to correct the imbalance. In addition, the high-tech machine can be fitted with a QR reader for identifying the rotors to be balanced and storing data for future reference. An Ethernet connection is supplied as standard.